Available in Many Sizes! Pistol and Rifle Calibers! As well as select sizes of shot shell pellets! 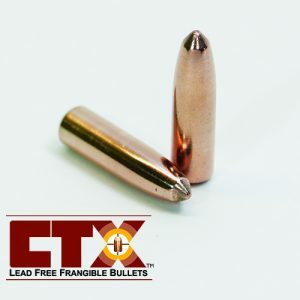 & Non-toxic: TomBob® CTX™ Frangible Bullets are constructed from materials containing no significant traces of lead or other harmful elements. 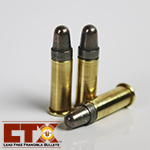 Pistol Calibers: Flat Nose or Hollow Point available on all sizes. Designated with -FP (Flat Point) or -HP (Hollow Point) on part number. Rifle Calibers: Taper Point or Round Nose style design, except CTX-50-600 which is Round Nose only.Designated with -TP (Taper Point) or -RN (Round Nose) on part number. 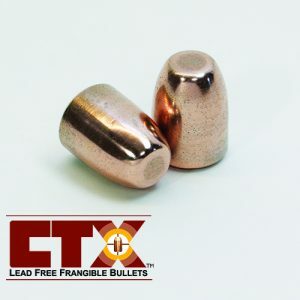 Breaks Apart Upon Impact: CTX™ bullets disintegrate into tiny particles upon impact to minimize their penetration for reasons of reduced hazard and limiting environmental impact. Frangible bullets are used in training situations to avoid ricochets. They are a great option for target shooting ranges where lead is banned. Click here for information on how to purchase CTX Bullets!